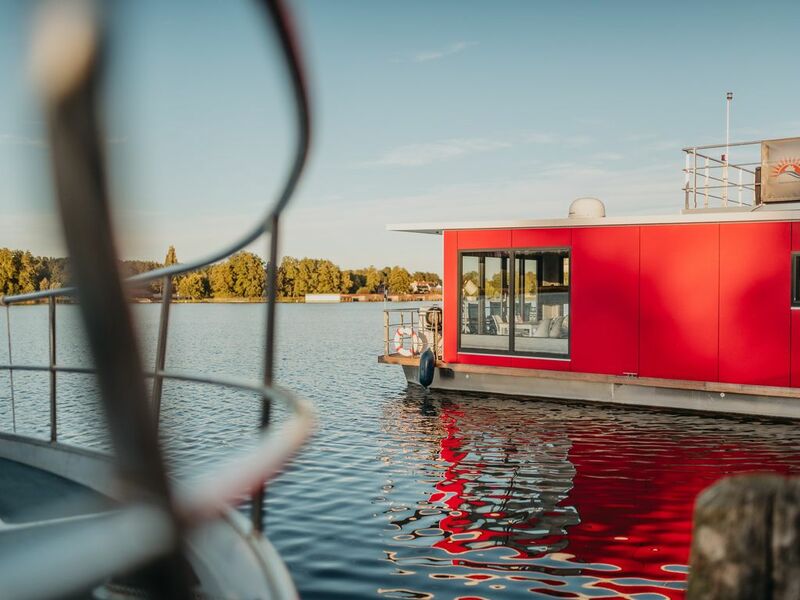 Our houseboat "Enola" is a Floating-Home 30 and had its launch in the summer of 2017. Its fixed berth has since then in the marina Röblinsee in Fürstenberg (Havel). Fürstenberg is an idyllic water city in Brandenburg and the gateway to the Mecklenburg Lake District. Our Floatinghouse is a fixed Riverloft. If you anchor here, you can let it go on 40 m2 of living space - or relax on one of the terraces in good weather. On cool and hot days, the built-in air conditioning in all rooms ensures a pleasant well-being. If you come to visit or land with the whole family, there are two bedrooms and a sofa bed to make yourself comfortable on the deck. Our houseboat can accommodate a maximum of 4 persons. Ideally, it relaxes here as a couple or as a family with children. In the morning you can step out of the house and enjoy the maritime environment and go for a swim in the lake before breakfast. Enjoy the food on the bow terrace or relax in the sun on the upper deck. Facilities include a stand-up paddle board and an inflatable boat with outboard motor. Experience the feeling of freedom on the water!